Time signatures are printed at the beginning of a piece and whenever the time signature changes. If a change takes place at the end of a line a warning time signature sign is printed there. This default behavior may be changed, see Visibility of objects. Mensural time signatures are covered in Mensural time signatures. In addition to setting the printed time signature, the \time command also sets the values of the time-signature-based properties baseMoment, beatStructure, and beamExceptions. The predefined default values for these properties can be found in ‘scm/time-signature-settings.scm’. timeSignatureFraction, a fraction describing the time signature to which these values apply. baseMomentFraction, a fraction containing the numerator and denominator of the basic timing unit for the time signature. beatStructure, a Scheme list indicating the structure of the beats in the measure, in units of the base moment. beamExceptions, an alist containing any beaming rules for the time signature that go beyond ending at every beat, as described in Setting automatic beam behavior. Different values of default time signature properties can be established for different staves by moving the Timing_translator and the Default_bar_line_engraver from the Score context to the Staff context. A further method of changing these time-signature-related variables, which avoids reprinting the time signature at the time of the change, is shown in Setting automatic beam behavior. Sometimes, a time signature should not print the whole fraction (e.g. 7/4), but only the numerator (7 in this case). This can be easily done by using \override Staff.TimeSignature.style = #'single-digit to change the style permanently. By using \revert Staff.TimeSignature.style, this setting can be reversed. To apply the single-digit style to only one time signature, use the \override command and prefix it with a \once. Notation Reference: Mensural time signatures, Setting automatic beam behavior, Time administration. In a part for an instrument with long periods of rests, tempo indications sometimes follow each other closely. The command \markLengthOn provides extra horizontal space to prevent tempo indications from overlapping, and \markLengthOff restores the default behavior of ignoring tempo marks for horizontal spacing. By default, metronome and rehearsal marks are printed above the staff. To place them below the staff simply set the direction property of MetronomeMark or RehearsalMark appropriately. New metronome marks can be created in markup mode, but they will not change the tempo in MIDI output. For more details, see Formatting text. Music Glossary: metronome, metronomic indication, tempo indication, metronome mark. Notation Reference: Formatting text, MIDI output. where duration is the remaining length of the partial measure before the start of the next full measure. The property measurePosition contains a rational number, which is usually positive and indicates how much of the measure has passed at this point. The \partial duration command sets it to a negative number, when it has a different meaning: it then says that the current (first) bar will be preceded by a bar 0 (the partial bar) with a duration given by duration. The \partial command should be used only at the beginning of a piece. If you use it after the beginning, warnings or problems may occur, so use \set Timing.measurePosition instead. In metered music bar lines are inserted and bar numbers are calculated automatically. In unmetered music (i.e. cadenzas), this is not desirable and can be ‘switched off’ using the command \cadenzaOn, then ‘switched back on’ at the appropriate place using \cadenzaOff. c4 c d8[ d d] f4 g4. Bar numbering is resumed at the end of the cadenza. Inserting a \bar command within a cadenza does not start a new measure, even if a bar line is printed. So any accidentals – which are usually assumed to remain in force until the end of the measure – will still be valid after the bar line printed by \bar. If subsequent accidentals should be printed, forced accidentals or reminder accidentals need to be inserted manually, see Accidentals. Automatic beaming is disabled by \cadenzaOn. Therefore, all beaming in cadenzas must be entered manually. See Manual beams. These predefined commands affect all staves in the score, even when placed in just one Voice context. To change this, move the Timing_translator from the Score context to the Staff context. See Polymetric notation. Notation Reference: Visibility of objects, Polymetric notation, Manual beams, Accidentals. Polymetric notation is supported explicitly or by manually modifying the visible time signature symbol and/or scaling note durations. Set a common time signature for each staff, and set the timeSignatureFraction to the desired fraction. Then use the \scaleDurations function to scale the durations of the notes in each staff to the common time signature. In the following example, music with the time signatures of 3/4, 9/8 and 10/8 are used in parallel. In the second staff, shown durations are multiplied by 2/3 (because 2/3 * 9/8 = 3/4) and in the third staff, the shown durations are multiplied by 3/5 (because 3/5 * 10/8 = 3/4). It may be necessary to insert beams manually, as the duration scaling will affect the autobeaming rules. Each staff can be given its own independent time signature by moving the Timing_translator and the Default_bar_line_engraver to the Staff context. % Now each staff has its own time signature. The simplest construction is a single list, where the last number indicates the bottom number of the time signature and those that come before it, the top numbers. More complex meters can be constructed using additional lists. Also, automatic beaming settings will be adjusted depending on the values. Music Glossary: polymetric, polymetric time signature, meter. Notation Reference: Automatic beams, Manual beams, Time signature, Scaling durations. Internals Reference: TimeSignature, Timing_translator, Default_bar_line_engraver, Staff. When using different time signatures in parallel, notes at the same moment will be placed at the same horizontal location. 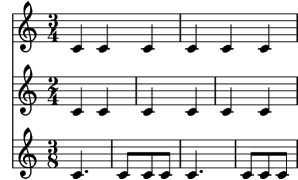 However, the bar lines in the different staves will cause the note spacing to be less regular in each of the individual staves than would be normal without the different time signatures. Long notes which overrun bar lines can be converted automatically to tied notes. This is done by replacing the Note_heads_engraver with the Completion_heads_engraver. Similarly, long rests which overrun bar lines are split automatically by replacing the Rest_engraver with the Completion_rest_engraver. In the following example, notes and rests crossing the bar lines are split, notes are also tied. These engravers split all running notes and rests at the bar line, and inserts ties for notes. One of its uses is to debug complex scores: if the measures are not entirely filled, then the ties show exactly how much each measure is off. Learning Manual: Engravers explained, Adding and removing engravers. Internals Reference: Note_heads_engraver, Completion_heads_engraver, Rest_engraver, Completion_rest_engraver, Forbid_line_break_engraver. Not all durations (especially those containing tuplets) can be represented exactly with normal notes and dots, but the Completion_heads_engraver will not insert tuplets. The Completion_heads_engraver only affects notes; it does not split rests. 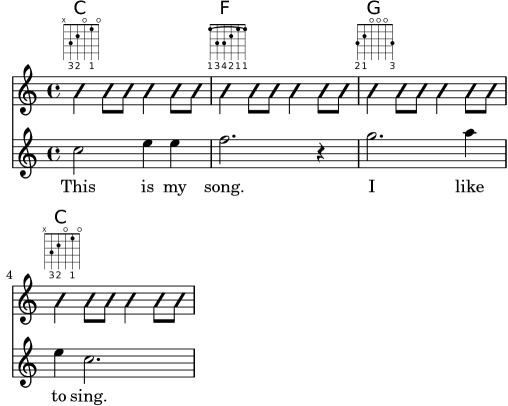 Guitar chord charts often show the strumming rhythms. This can be done with the Pitch_squash_engraver and \improvisationOn. For guitar music, it is possible to show strum rhythms, along with melody notes, chord names and fret diagrams.